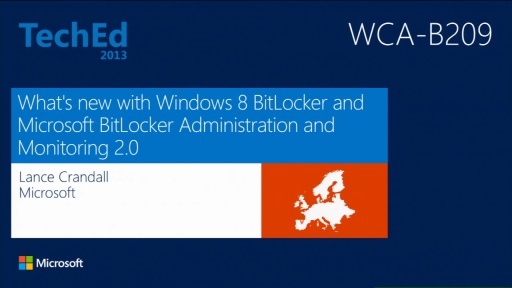 Come check out the new version of Microsoft BitLocker Administration and Monitoring 2.5—from the Microsoft Desktop Optimization Pack (MDOP) for Software Assurance—it takes BitLocker to the next level by simplifying deployment and key recovery, centralizing compliance monitoring and reporting, and minimizing the costs associated with provisioning and supporting encrypted drives within your organization. This lab enables you to experience and use many of the new features such as System Center Configuration Manager integration, self-service recovery, PIN complexity, and Windows 8.1 support, just to name a few. BitLocker Deployment Using MBAM Is a Snap!